If you would like the Regis University coaching staff to do a satellite camp please call or email us. Our high school team camp is available to teams only. If you are a high school coach and you are interested in our camp for next summer please send us an email. Our team camp combines skill instruction, drill demonstration, as well as competition. 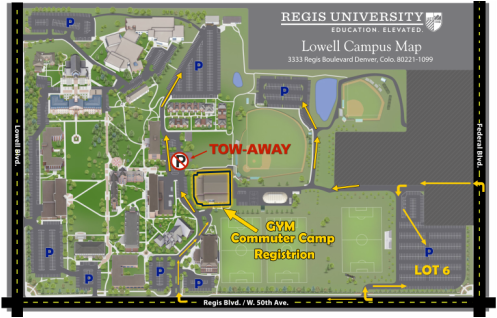 The camp is held on the campus of Regis University and is open to JV and Varsity teams. Participants need to fill out the medical release form in order to participate in the camp. Your high school coach also has the form for participants. "The relationships my players and coaches develop with Regis athletes and coaches and Regis Team camp, has been a pivotal factor in our program development at my High School. We went from 9-14 during 2016 to 14-9 in 2017. This camp allows players to improve in individual as well as team skills in just three days. Unlike the typical scrimmage camp, this camp improves team offense and defense by scrimmaging teams in game like drills. Each team has a college player as a coach. My players love to go to Regis games during the season to cheer on their camp coach! Our camp coaches have come with Regis coaches to our high school matches as well! They take time out of their busy college season to cheer us on and then give the girls valuable feedback after a match. High school coaches have the opportunity to sit back and take notes on new drills and ideas. This is a great time to work with new coaches on your high school staff and talk about drills and practice design. It is a great time to get feedback from other coaches about the best systems to run with a particular group of athletes. This is one team camp I feel is definitely worth the money because of the individual and team development. Every athlete that attends camp has the opportunity to improve because it is not simply a scrimmage camp. They have the opportunity to ask top coaches and colleges athletes for one on one tips and assistance. My players enjoy going to camp year after year. The final day is the ladder tournament where the teams are battling to finish in the main gym. The top team gets the coveted chance to scrimmage the Camp Staff!" There will be some construction on campus the week of camp. Please drive carefully through campus. Park where the blue P's are labeled. Registration will be done in the lobby of the gym. Please check in with your high school coach, he / she will be getting your team registered Monday morning.